This week I have made several visits to the Nordic Pavilion which unsurprisingly is the very epitome of everything Nordic. Designed by architect Sverre Fehn the structure incorporates surrounding trees and seems to be constructed almost entirely of light and air. The space rather appropriately acts as a common ground for Finland, Sweden and Norway and showcases their love of raw and honest material. All thirty two pieces are made specifically for the Biennale by architects born after 1962 and are displayed on plinths designed by Juhani Pallasmaa. The exhibition is called Light Houses: on the Nordic Common Ground and responds to issues bought about concerning the financial restraints and the depletion of natural resources available to architects today. In this soothing wood clad environment the objects seem to whisper to one another creating a feeling of reverence and calm. The piece I was most drawn to was the Silent Bell made by Fantastic Norway who gifted the bell to Utoya after the tragic events of July 22nd 2011 when 69 residents lost their lives. This piece is to be shipped to Utoya after the Biennale to be displayed in a new belfry in the town center, which is part of the plan for regeneration instigated by the Labour Youth Party who owns the Island. Wooden bells were often used to replace metal ones throughout Christian history as a mark of respect for the dead during Easter. In addition the word belfry stems from the German words ‘bergan’ meaning to protect and ‘frithuz’ meaning peace which makes the bell a heartfelt and meaningful way of restoring harmony to the town. Another of my favorite pieces from this pavilion was created by LKMM Architects based in Finland. I like this piece because it looks as if there was little human interference, only an effort to conserve and protect the greatest architect of all; nature. 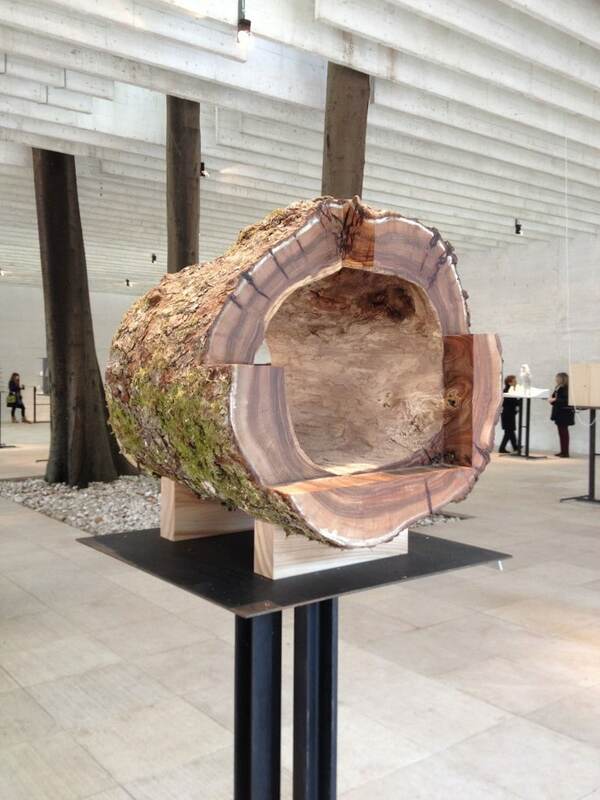 The sculpture is made from a piece of ash tree that the team found whilst on a visit to Fiskars. The log had a rotten core which the architects decided to remove before attempting to preserve the outer shell. This process is full of care and shows a certain sympathy for the material, ensuring there was minimal damage done to the bark. The log was then skillfully cut, one end being sawn and the inside being brushed and oiled. This minimalist piece is displayed next to the trees that protrude into the Nordic pavilion emphasizing the similarities and differences between a natural and manmade environment. It also brings to light the importance of craftsmanship and the possibilities for traditional materials. I also visited the Palazzo Fortuny this week which is a wonderfully crumbly museum in the north of Venice holding an exhibition of several artists work – more on this next time!